The pairing of the two Chinese zodiac signs horse and tiger is quite favorable. They will undoubtedly have a contented relationship. 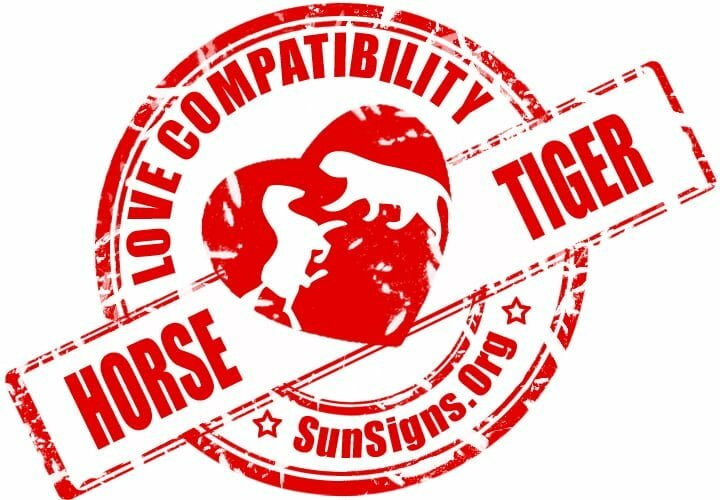 The horse tiger compatibility can help form an easy connection, no matter the kind of relationship, whether it be friendly, romantic, or business related. Some will see the tiger as the ruler in this relationship. It is true that those born under the Chinese zodiac sign of the tiger are assertive and command situations with their daring nature. However, those born under the Chinese astrology sign of the horse are known to be lively and self-sufficient and are not just other followers. The brilliant thing about the horse and tiger compatibility is that they have very complementary objectives and concerns so neither partner has to lead the other. The Horse and Tiger relationship is compatible due to the comparable buoyant, positive, and entertaining perspectives of this couple. Together, both will most often be seen going out and about together. They might be furthering their social lives or performing community works projects. Either way, they are trying to widen their group of friends and other contacts. They also wish to help others see their optimistic outlook for themselves. The horse-tiger soulmates are both typically looking and moving in the same direction. They both have a collective desire for independence but it works very well for them. Maintaining their self-sufficiency means their connection doesn’t grow stale, but stays original and unregulated for both. While dating the horse and tiger also have a spirited, entertaining, and impassioned way of viewing life. Both partners are evenly affable and excited. The horse-tiger is excellent in all terms for along-lasting relationship. They are both determined, outgoing, and endearing. The Chinese Horse man or woman are especially at risk of randomly fleeing a relationship, particularly when the other partner tries to enforce responsibilities and intentions on them. Luckily in this case, the male or female tiger feels somewhat similar and so has no desire to force their partner to fit their mold. Both the horse and tiger in love, recognize that the other has a wish to do things the way they see fit. They also each harbor an urge to wander about. Being able to see this in each other means they accept it where others might not be able to. Sexually, the horse and tiger in bed, should be mutually fulfilled. It might not last very long in that respect, as horses are often want to change quickly. Tigers are more benevolent and affectionate and may be more reliable in romance than their partners. Chinese astrology compatibility predicts that the tiger does seem to be the more vigorous of the two. They enjoy the partner’s character. They will find they are drawn to their lover’s energetic personality. The tiger man or woman will provide the energy for their relationship. The horse revels in their partner’s fickleness and autonomy. They are drawn to their partner’s dynamic and bold personality. They are usually great with money. In the horse-tiger marriage, they usually share an identical outlook and so their goals are very much aligned. They each have a tremendous sense of humor and will have quite a bit of consideration for each other and their style. The marriage compatibility between these two can result in great intimacy. These two Chinese zodiac signs coming together promises an intriguing union together. A horse husband and tiger wife are an optimal joining. Together, they function in synchrony. The wife receives a better peace of mind from the male horse. Their union creates an unbreakable bond that is never-ending. A tiger husband and a horse wife are continually enthusiastic to see each other and spend time together. He will adore her imaginative wit. His spontaneous nature does not aggravate the female horse. They make a very ideal pairing. Horse & Tiger Chinese Horoscope Compatibility Rated 5 Hearts!